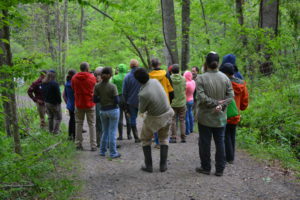 More than 15 participants braved a drizzly evening to attend the first Twilight CRAFT Tour of the year about Foraging & Forest Farming in Appalachia. 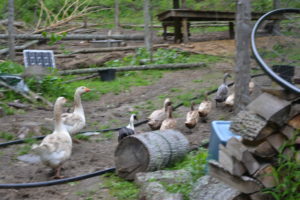 Our hosts were Osker and Amber Brown of Glorious Forest Farm, a 100-acre mountainside farm in Mars Hill, NC. 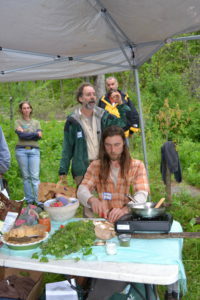 Alan Muskat and his apprentice, Mason, of No Taste Like Home discussed how to incorporate foraged foods into farm offerings, while Glorious Forest explained the intricacies and beauty of forest farming in action. 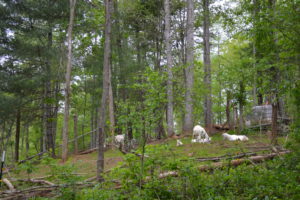 Glorious Forest was bought in 2012 by Osker and Amber Brown who had a vision of a perennial haven that started with cultivating oak trees for acorns. Osker really stressed that his best luck selling his products thus far has been through adding value to them; “When people see something that they don’t know what to do with, they get excited but then ultimately don’t buy it because [the processing is] too daunting. It’s best to have it processed for them.” After trying to sell acorn flour at the market, they quickly switched to selling acorn flour cookies. “Now we have complete acorn cookie addicts,” chuckled Osker (the writer is actually an addict herself). They also sell sochan pesto, made of one of the most abundant greens on their land. 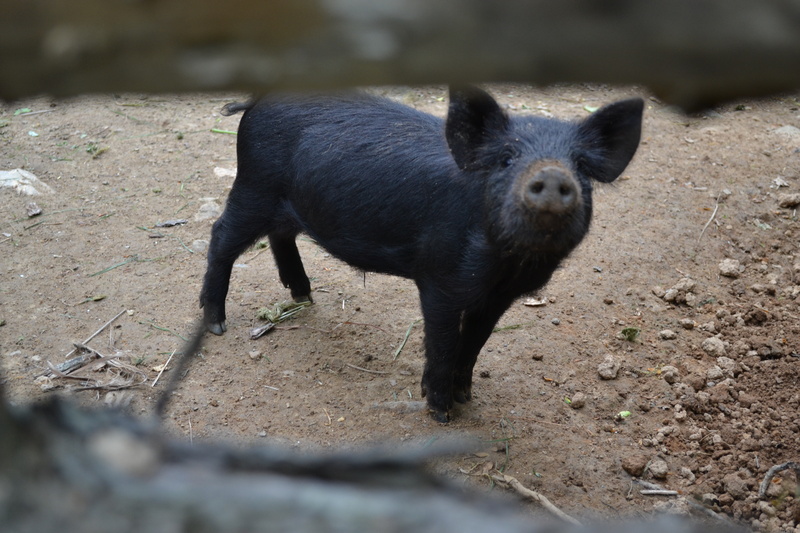 Osker’s acorn crop is now mostly dedicated to pig feed—his operation includes a breeding pair of pigs whose offspring he selects to be as appropriate as possible for foraging between the trees on his terraced hillside. 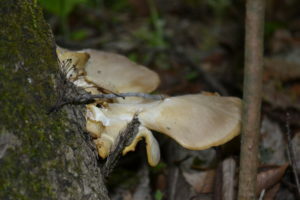 This foraging lifestyle, once a natural process, often includes un-doing what has been done over the last few centuries in the breeding lines. 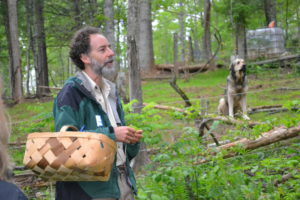 He selects for foraging ability or weight gain from low-carb wild foods (as opposed to selecting for weight gain from a grain-based diet). Osker ultimately butchers and sells these foraging animals. 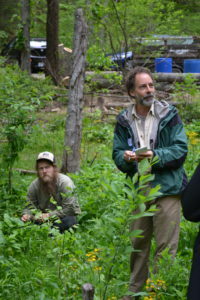 Before running No Taste Like Home, Alan sold wild foods to restaurants in Asheville; one of his favorite wild foods happened to be five feet away from us which he identified as Solomon’s Seal, a green that he would sell for $12–20 per pound to restaurants. 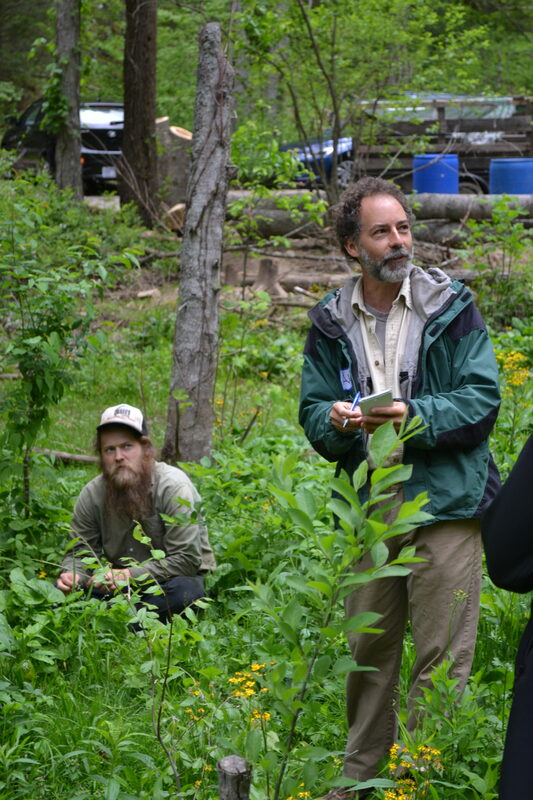 He referenced bamboo shoots, many different kinds of mushrooms, spruce tips, and spicebush as common plants that the restaurant industry has an interest in, suggesting New Appalachia Foods as a good distributor. 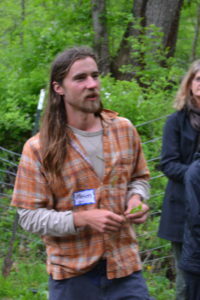 He also addressed that bars and breweries are often good places to keep in mind when trying to market wild foods. No Taste Like Home partners with the bartender at Nightbell, for example, and Sierra Nevada is considering making a spruce-tip beer. In general, his foraging career made him about $30 per hour, including the time he spent marketing his products. 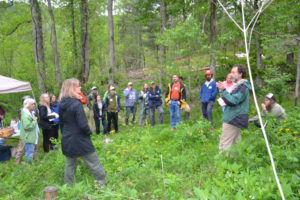 However, he did echo Osker’s sentiment about the advantage of adding value to wild and foraged food products thereby removing the processing barrier from direct-market sales. 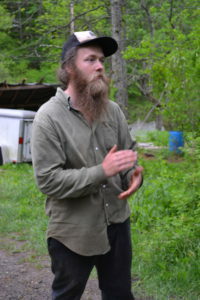 Ryan Milt, who now owns Alan’s Asheville Wild Foods business, has been adding value to the products that Alan previously sold wholesale to restaurants—therefore getting market price—by making medicinal tinctures, selling pre-inoculated mushroom logs, and selling ramp salt. 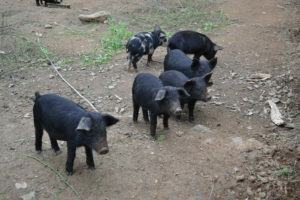 Alan soon discovered that agritourism is also an excellent market in this area. 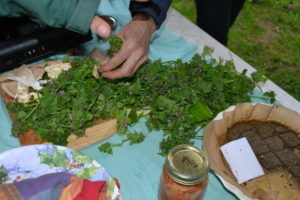 No Taste Like Home partners with local farms to do foraging walks on their property, which brings in revenue for both NTLH and the host farm. No Taste Like Home also offers apprenticeships which can give budding foragers practice in plant and mushroom ID. Thanks to both No Taste Like Home and Glorious Forest for hosting us! 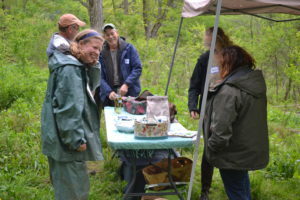 Hope to see you all at the June CRAFT tours, but meanwhile, happy forest romping! 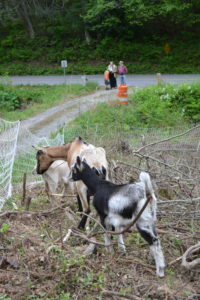 The goats observing the visitors. Osker and Alan in their element. Mason, No Taste Like Home Apprentice. 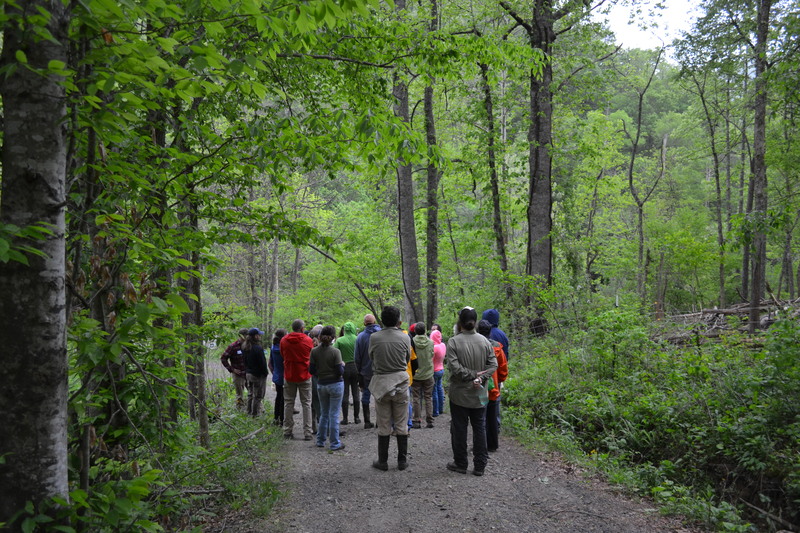 The group in the woods. Dead nettle being cooked up for a post-tour feast. Abundance of dead nettle and delicious oyster mushrooms for the potluck.